Once I've completed the tuning of the piano, each of my customers receives a sheet which shows the beginning tuning and ending tuning (measured in 'cents'), my ratings for some of the working parts of the piano, as well as more detailed information on how to best keep the piano in tune. 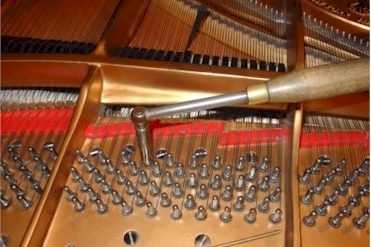 It is also recommended to tune a piano approximately every 6 months. Additionally there is a 10% discount for existing students. So get that piano tuned! The sooner the better, and if done every 6 months, that's the best! To reach me for a piano tuning, please contact me via the "Contact Us" page linked above.